Uncover the many layers of South America on this journey through three extraordinary countries. 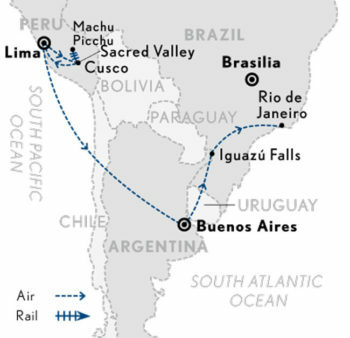 Uncover the many layers of South America on this journey through three extraordinary countries. Explore the ruins of the once-glorious civilisations in Peru. Fall in love with Buenos Aires and its insatiable passion. Drink in the natural wonder of Iguazú Falls. And be swept away by the magnetic energy of Rio de Janeiro. Experience ancient cultures thriving in the Sacred Valley. Ride the rails to Machu Picchu onboard the luxury Hiram Bingham train. Move to the rhythms of South America’s sensuous dances: tango and samba. Witness the wonder of Iguazú Falls. A warm A&K welcome and transfer to hotel. This morning touring begins at the Plaza Mayor, the official centre of the city. See the 16th century cathedral, an architectural marvel, and the Presidential Palace before driving through modern Lima to the fascinating Larco Museum which houses one of the largest private collections of pre-Inca ceramics in the world. An optional culinary experience is available today with top Lima chef Penelope Alzamora at her home in Barranco (additional cost) (B). Fly* to Cusco then stop for lunch at Limo restaurant before travelling by road into the Sacred Valley, full of archaeological sites, Inca terraces and colonial churches. Visit Awanakancha, a centre where South American camelids including llamas, alpacas, guanacos and vicuñas are bred. Learn about the renowned fibres created from their fleeces, as well as ancient weaving techniques which are still used today. Remainder of afternoon at leisure (B,L). A rewarding day starting with a visit to the Kuychi Centre, created to support the Children of the Rainbow project. Continue with a unique visit to an Andean highland community to meet local Quechua-speaking farmers and weavers. This personal encounter introduces you to the lifestyle and traditions of these Incan descendants. Lunch is at Hacienda Huayoccari, an elegant farmhouse high in the hills. Remainder of the afternoon at leisure (B,L). A morning visit to the impressive fortress of Ollantaytambo, a formidable stone structure which was the site of the Incas’ greatest victory against the Spanish. Next, board the Vistadome train to Machu Picchu where a late morning arrival gives you time to begin your explorations of this breathtaking Inca citadel with your guide. Well preserved, most of the outlying buildings have been reconstructed giving an excellent picture of what the structures originally looked like (B,L,D). An option to further explore the site of Machu Picchu at sunrise or enjoy a hike with your guide. Later board the Hiram Bingham luxury train to Cusco with gourmet dinner included on board (B,L,D). This morning enjoy a city tour which includes the Cathedral on the Plaza de Armas and the Santo Domingo Temple or Koricancha, a Dominican Church and convent built on the foundations of the Inca’s principal religious building, dedicated to sun worship. You also visit the ruins of Sacsayhuaman outside of Cusco, a testimonial to Incan architectural skills. This ancient fortress where the greatest battle between the Spanish and Incas took place overlooks the red-tiled roofs of Cusco and spectacular countryside (B). Fly* to Lima and connect with your onward flight* to the Argentine capital, Buenos Aires, where a private A&K welcome awaits. (B). This morning you are driven through the leafy streets of Palermo with time to explore the famous ten acre Recoleta cemetery where generations of Argentina’s elite are buried, including Eva Peron. Dinner and a tango show are included at Esquina Carlos Gardel with VIP seating (B,D). Visit the colourful La Boca district once inhabited by Italian immigrants and home to football giants Boca Juniors. Explore the Bohemian delights of San Telmo and visit the beautifully restored 19th century residence El Zanjon, an important urban archaeological site (B). Transfer to airport for your flight* to Foz do Iguaçu. Your hotel is within the Brazilian National Park and an easy walk from the falls (B). Explore the Argentinian side of the Falls and get up close to the thundering torrent. Walk through the jungle to a catwalk for dramatic views (B). Fly* to Rio de Janeiro where incredible contrasts of colour and dazzling scenery awaits. Head to your beachside hotel and enjoy the afternoon at leisure. (B). Take in the sights this morning including a cable car ride up Sugar Loaf, Guanabara Bay. After a typical Brazilian BBQ lunch visit the statue of Christ the Redeemer, one of the Seven Wonders of the Modern World. with time to explore the bohemian Santa Teresa neighbourhood. (B,L). Explore this vibrant city, your way. Choose to move to the hypnotic rhythm of Brazil’s famous dance at Grande Rio’s samba school. Or venture into the city’s favelas for an intimate look at shanty town life and a new understanding of Brazilian society. (B). Your journey ends with a transfer to the airport (B).